John Chapman (left) said he feels the time is right to challenge William Keating. For months, political handicappers have been following one congressional race in the state as the marquee contest, the North Shore campaign that has already toppled the incumbent and now pits Republican Richard Tisei against Democrat Seth Moulton. Increasingly, however, strategists in both parties are focusing attention on a previously quiet race in the Ninth District, in Southeastern Massachusetts, where little-known Republican attorney John Chapman is waging a tightening fight against two-term incumbent Democrat William R. Keating. Keating visited Democratic lobbying firms in Boston last week “letting people know that he needs help,” his campaign cochairman said, and some Republican strategists have quietly urged the party to shift resources from Tisei toward Chapman. “I think people are starting to have a greater understanding of the dynamics at play in the Ninth, and they’re more beneficial than those in the [Tisei-Moulton race], and for that reason they’re urging people to take another look at the Ninth,” said David Tamasi, a Washington-based GOP lobbyist and fund-raiser with Cape Cod ties. Against Keating, Chapman has a heavy financial disadvantage to overcome, with just over $127,000 on hand on Aug. 20, the most recent reporting date, compared to Keating’s war chest of more than $720,000. And the last time a Republican beat a sitting Democratic congressman in Massachusetts was in 1992. Democratic strategists say they are confident: Keating himself says polls show him with a double-digit advantage. But Chapman says the time is ripe for a challenge. An underfunded first-time candidate, Chapman, 50, nonetheless stands to benefit from political macrotrends: a Democratic president with flagging popularity and a competitive governor’s race in which the Republican nominee, Charlie Baker, is expected to rival the performances of recent Republican candidates who have done better in the Ninth district than they have statewide. Republican Gabriel Gomez lost the 2013 special Senate election by 10 points overall, but won the Ninth district by 7 points. In 2012, with a presidential race topping the ballot, Scott Brown lost his reelection bid against Elizabeth Warren by 8 points, but took the Ninth by a 1-point margin. Other races could also help bring out right-leaning voters in the district, which stretches from parts of the South Shore to the South Coast and covers all of the Cape and the Islands. The contest to succeed Democratic state Senate president Therese Murray, of Plymouth, has drawn a strong GOP candidate in longtime state Representative Viriato “Vinny” deMacedo against Democrat Matt Patrick. 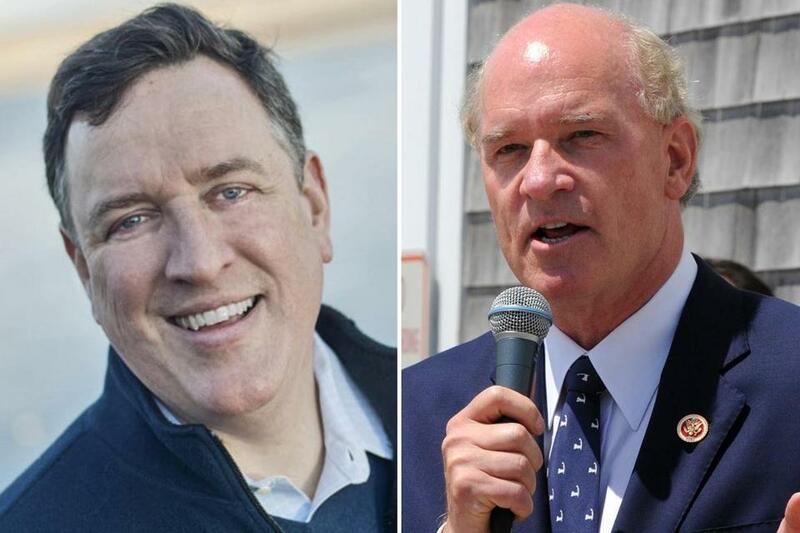 In addition, Cape and Islands District Attorney Michael O’Keefe, also a Republican, has drawn his first challenger since he was first elected in 2002, Democrat Rick Barry. Keating said the political dynamics are not as worrisome as they appear, because of the district’s strong history of independent-minded voting. “This is a district where people . . . vote the person,” he said Friday. Chapman has criticized Keating on his support for the Affordable Care Act, votes to lift the debt ceiling, and on border security, all nationally tested arguments that Republicans use against Democrats. Closer to home, he has zeroed in on Keating’s 2012 vote on legislation that sharply boosted flood insurance rates. “We are primarily a coastal district, and I think Bill Keating should have raised his hand and said, ‘Wait a minute, I’m not going to vote along party lines here. I think we’ve got to think about the interest of the district first. We need to know more’,” Chapman said. That vote, heavily bipartisan, came on a larger transportation bill that included language to block a doubling of student loan rates, Keating pointed out. He also noted that he later helped cobble together a bipartisan coalition for legislation that would, in the long term, make flood insurance more affordable. Chapman is a former partner at the Duane Morris law firm and general counsel for the Joslin Diabetes Center. He and his wife have a son and live in Chatham and Brookline, according to his campaign biography. At a meeting of the Cape Cod Republican Women’s Club at a restaurant in Yarmouth last Friday, Chapman was the clear standard-bearer for a local party that is obviously feeling its oats. The Republicans’ strategy of tying their Democratic opponents to unpopular Washington extends down the ballot, to an organic cranberry farmer running for Barnstable county commissioner, who notes that, while his own campaign literature features him standing next to his cow, Stella, his Democratic opponent’s depicts him standing in front of the US Capitol, far from the district. Such accusations echo Chapman’s attacks on Keating. On Monday, Chapman’s campaign circulated an Internet ad entitled “Invisible,” depicting Keating as an absentee congressman. “I think he hasn’t represented the small business, he hasn’t represented our aversion to overreaching government,” Jo Ann Sprague, who succeeded Keating in the state Senate and who now lives in Chatham, said in an interview outside the women’s Republican club luncheon. Jim O’Sullivan can be reached at Jim.OSullivan@globe.com.